David Rozovski is a man on a mission — to get on a NASA mission. He would like nothing more than to be selected as an astronaut. But if that doesn’t come through, he’ll settle for anything having to do with aviation. Doctoral student David Rozovski hopes some day to fly to space as an astronaut. For now, he satisfies his interest by studying — and piloting — helicopters and planes. Rozovski, a doctoral student in industrial engineering, is focused on aviation human factors, studying how power is controlled in an aircraft with the goal of eliminating pilot error. His goal is to work in flight deck design as a test pilot and engineer. And, yes, he does plan to apply to the astronaut corps. An intensely driven spirit, he may just have the right stuff. By the time he arrived at Purdue in the fall of 2008, Rozovski had already completed several NASA internships and had applied for a patent for a novel power system for tiltrotor aircraft. He’s also a licensed plane and helicopter pilot who, in his free time, flies from Purdue to spots like Cleveland to clock hours. He vows that before completing his doctorate he will hold all pilot licenses through commercial multi-engine, which will enable him to be the pilot testing his own research. Rozovski used his piloting skills on dry land as a driver during Purdue’s inaugural Electric Vehicle Grand Prix in April. In April, Rozovski was firmly on the ground in a flight deck of another sort, using his navigation skills to drive an electric go-kart for one of the IE entries in the University’s Electric Vehicle Grand Prix. The battery powered karts, built by the teams, reached speeds of up to 45 mph as they hummed through the chicane and down the straight-aways. 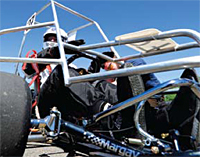 The Electric Vehicle Grand Prix was conceived as part of a $6 million federal grant awarded to the University in August 2009 for creation of the Indiana Advanced Electric Vehicle Training and Education Consortium. The group is charged with educating and training the workforce needed to design, manufacture and maintain the electric vehicles of tomorrow. As an added benefit, it is also helped train an aviation engineer. “My specific focus for getting involved in the race was to gain a better understanding of what is entailed in taking a brand-new vehicle and running it through its paces in order to validate the design and safety features so it can perform in a variety of environments,” Rozovski says. Not such a stretch from aviation design. Born in New York City and raised in Chile, Rozovski attended public schools in Santiago through high school, and then returned to the United States for college with the goal of going to medical school. He enrolled at Linfield College in Oregon as a psychology major, and was on-course until junior year when his interests began to change. Back home in Santiago for vacation, he tried to sort things out. On a whim, he did a keyword search using his four interests: aviation, engineering, psychology, and medicine. Result? Human factors. He narrowed the field: human factors, rotors, NASA. Result? A sort of high-tech matchmaking — NASA’s Ames Research Center in San Jose, California. He contacted the center for more information and was directed to the University of Illinois and its master’s program in human factors. In the summer of 2006, he joined the NASA research center as an intern. His first assignment was to complete an algorithm that would allow helicopters to fly at low level without crashing. He declined to tell his supervisor that he wasn’t a math major and had no idea how to create an algorithm. Instead, he opted to read every book he could on the subject, and successfully completed the assignment. Rozovski’s second NASA internship came the next year. Then, after completing his master’s degree, he took a summer position with the Boeing 787 flight deck team. Rozovski’s doctoral research — a continuation of work begun at the University of Illinois — focuses on flight deck design and ways to eliminate pilot error. His advisor, Steve Landry, is a kindred spirit; a former military pilot, aspiring astronaut, and specialist in human factors and aviation. It was Landry who drew Rozovski to Purdue. 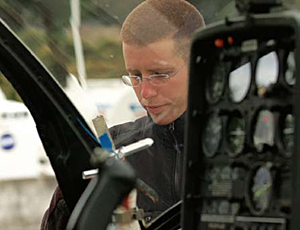 Rozovski’s doctoral research focuses on flight deck design and ways to eliminate pilot error. 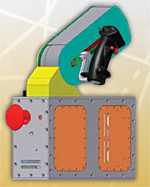 His novel power control interface for tiltrotor aircraft, shown here, is in the patent application process. During his master’s degree studies in Illinois, Rozovski designed — and is now in the patent application process for — a novel power control interface for tiltrotor aircraft. The military’s V-22 Osprey, in use in Afghanistan, is the best-known tiltrotor. Its engines can be rotated for either a helicopter-like vertical takeoff and landing or a fast forward speed like that of a turboprop. The aircraft could have commercial application in situations where runway space is tight and travel time is relatively short, as in delivery from small urban environments to major airport hubs, as NASA envisions it. The challenge for tiltrotor pilots lies in the way the two different vehicles are controlled. If pilots use the control lever from one aircraft while in the other aircraft’s mode, it can cause a control reversal or error. In a control reversal, pilots know what they would like to do, but input the opposite action by mistake; this can be a fatal error. Rozovski’s Rotational Throttle Interface (RTI) mimics the angle position of engines, making control much more intuitive. As Rozovski moves into the test phase of his lever system research, he is a man consumed. The intensity that has guided him through his studies and keeps him sharply focused is evident as he talks about his work, scrolls to photos of it on his cell phone, and discusses scheduling life around the machining of an integral part. This intensity may just land him on the moon.